We all know cats have claws. These sharp nails are used to mark territory, aid in climbing and even for swatting at an offending person or another animal. But even though these claws are a natural part of the cat’s physical and mental makeup, they do need to be trimmed. 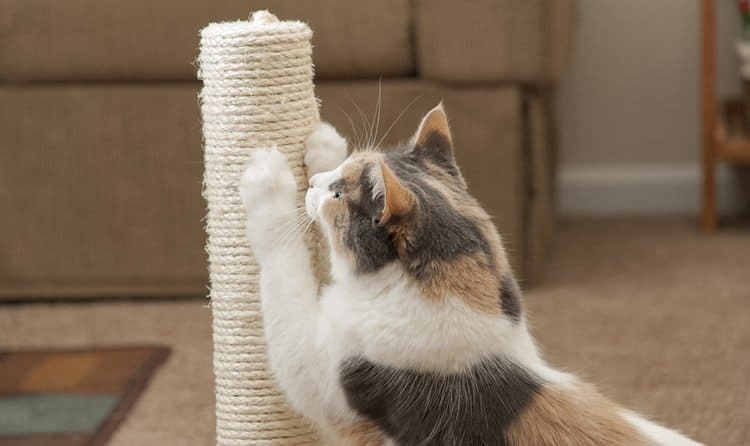 Read on to discover the reasons why you need to trim your cat’s claws, the types of cat claw clippers to choose from and some great tips on making cat claw clipping a breeze. Plus, we will also review our top 4 picks for the best cat nail clippers on the market today. Why Do I Need to Clip My Cat’s Claws? According to Vetstreet.com there a few reasons why we should keep Kitty’s claws trimmed. One of these reasons is for the general health if the nail itself. Broken and chipped nails can be very uncomfortable for your feline friend and can also get caught on those soft surfaces when they are walking or jumping. Does your cat like to knead you? Then another good reason is for your own comfort – those sharp points can create some pain when Kitty is being loving. Lastly, if your cat decides to scratch your furniture, then at least those shorter nails will do less damage. There are two basic types of cat claw clippers; the guillotine and the scissor-style. Let’s claw our way through the facts about these grooming tools. As the name suggests, this cat claw clipper works similar to a real guillotine. To use this clipper properly, the nail is inserted through the metal hoop on the end of the clipper. The handle is then depressed allowing the blades to slide across the loop. The nail is then clipped. The good thing about this style of cat claw clipper is many of them come with guides to help prevent cutting into the “quick” (bloodline) of the nail. Some manufacturers also make the handles slip-proof for a firmer grip. However, the guillotine clippers will become dull after several uses, so the blades will need to be replaced. This style of cat claw clipper looks and works very much like “normal” scissors. The nail is simply placed between the two blades and trimmed off. The great thing about the scissor-style clipper is the blades seldom dull and they may be easier to handle than the guillotine type. However, the scissor-style clipper does not come with guards, so the nail may be easily clipped too short. Here’s a quick demo on trimming a cat’s claws. If you can, start your claw clipping routine when your feline friend is a kitten. Make it as comfortable as possible with kind words, lots of praise and treats. If you’re cutting an adult cat’s nails, it’s helpful to catch your cat when she’s sleeping or relaxed, since she’s already in a comfortable state. Oftentimes it’s the noise of the trimmer that scares a cat, not the nail cutting itself. For this reason, allow your cat to sniff the clippers before you use them. You can place a treat on top of the trimmer as well to encourage your cat to view the clippers as safe and “fun.” Once your cat is comfortable with the clippers, take a piece of uncooked spaghetti and trim the end off of it. This is done to create the noise your cat will hear when her nails are being trimmed. Reward your cat with another treat. Repeat this process until she becomes accustomed to the sound the clipper makes. Gently take your cat’s paw and massage it for a count of three. If she pulls away, then allow her to do so without pinching or pulling it back. Once she relaxes, once again take her paw and gently press the toe so the nail extends out. Look for the quick then trim just in front of it. Repeat the process until all the nails are trimmed. With so many choices when it comes to choosing the best cat claw clippers we’ve done some research and have found four that may be the purrfect choice for you. This professional-grade, scissor-style cat nail clipper ensures quality control right from the manufacturer; the parts will not loosen or fall apart with use. The stainless steel blades are sharp to ensure a clean cut the first time and will stay sharp for many years. 15% of every purchase goes to help other animals in need through the American Animal Rescue Society. One concern that may come up is the scissor-style cat nail cutter may be too uncomfortable to use for those folks with bulkier hands/fingers. The overall rating of the Pet Republique cat nail clipper is 5 out of 5 for its professional quality, grip, and sharp stainless steel blades. This unit is also very reasonably priced. This guillotine-style clipper has sharp stainless steel blades that are sure to last a long time and get the job done right. The handles provide grooves for a comfortable grip and are also rubberized to keep them from slipping. In addition, the safety stop will keep you from cutting too much off of the nail. One concern that may come up the guillotine-style clipper is not for everyone as they can find it bulky and difficult to handle. The overall rating of the Safari cat nail clipper is 5 out of 5 for its quality, durability and comfort grips. This is a great unit for folks that prefer the guillotine style nail clipper. Made with the “nervous” pet parent in mind, the Pro Pet Works Nail Clipper comes with everything you need to give your cat a “spa” day. This durable and well-made clipper comes with a built-in file for smoothing over any rough edges and a nail guard for the safety of your cat. The full step-by-step instructions are sure to please the person that may be apprehensive of clipping nails for the first time. One concern that may come up is the nail guard is not there for trimming accuracy, but rather as a guide. The overall rating of the Pro Pet Works Cat Nail Clipper is 5 out of 5 for its ergonomic fit and overall durability and excellent design. Recommended by veterinarians and pet professionals, the BOSHEL Clipper is earning itself high marks for its overall design and quality. This scissor-style claw clipper has super sharp stainless steel blades for a smooth cut every time. The semi-circular blade provides you with a safe and comfortable angle to better see where the quick of the nails are which will prevent those painful bleeds. One concern that may come up is the BOSHEL nail clipper may not be the best choice for larger pets. The overall rating of the BOSHEL cat nail clipper is 5 out of 5 for its unique design and its overall quality and durability. We have four top of the line cat nail clippers in both the scissor and guillotine style categories. These have stood out among the rest for their durability, price point, and overall effectiveness. If you’re shopping for the best cat nail clipper you can find, then choose from our top four picks to get the quality and durability you are looking for in this product. Once you have your cat nail clippers, be sure to use our helpful hints and tips to make trimming your cat’s claws an easy and enjoyable routine. Thank you for the recommend. In the past, trimming my cat’s claws is a headache thing for me. I will pick one more nail clipper to trim my cat’s claws.